Being the ship's photographer for almost two years now, I really have to kick myself for not submitting pictures to Navy News. 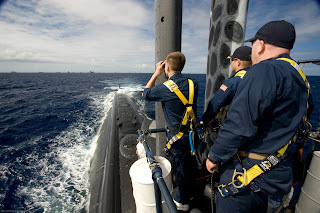 I have shot almost ten thousand images of life aboard the USS Los Angeles (SSN 688) and how many of those have made it to Navy News? An embarrassingly small handful. Nevertheless, I have been supremely appreciative of the command allowing me access to document life aboard the Navy's oldest active fast-attack, and it has doubtlessly made me a better photographer. That being said, although it's a little late in the game (Karen & I are transferring to Charleston this month), I sent a few shots in from the recent Rim of the Pacific (RIMPAC) 2008 exercise. This one actually got picked--out of the entire Navy--for one of the Images of the Day, July 31, 2008. It was just the photographic ego boost I needed! There were 10 countries represented this year. In this picture, the CO, Navigator and TM3 Vandal are looking aft at the 23 surface ships that teamed up in a massive grid formation for a photo exercise. We were one of three submarines in front. (They just put us subs in front so you can actually see us in a photo.) They stationed helos all around to shoot pics, and then flew two P3's and four F-18's in low through the middle. It was by far one of the most impressive experiences in my naval career! you like some posted at www.ssn688.com?